This article explains about various recycling symbols and their meaning. Do you get confused with recycling symbols? I do, sometimes. As the recycling and environmental trend continue to grow, so do the proliferation of different recycling symbols in the products and packaging that we use everyday. Not all recycling symbols are designed for the consumers’ benefit. Some of these are meant to assist the recyclers (the technicians who sort out the collected materials in a recycling facility) while others represent an organization that the manufacturer of the product or packaging belongs to. Industry or organization related recycling symbols. For manufacturers, the use of most of these symbols and the term “recyclable” or “recycled” are governed by government agencies and regulations to protect consumers against fraudulent claims of companies trying to catch in on the recycling and environmental awareness of people. In the US, this usage is governed by the Federal Trade Commission’s Guides for the Use of Environmental Marketing Claims. This is perhaps the most ubiquitous of the recycling symbols. This recycle sign has no specific meaning but is understood to represent the specific steps in recycling (collection and sorting, remanufacturing, and purchase of recycled products) and is widely accepted internationally. It has no copyright restrictions, and anyone can use the Mobius Loop recycle logo. 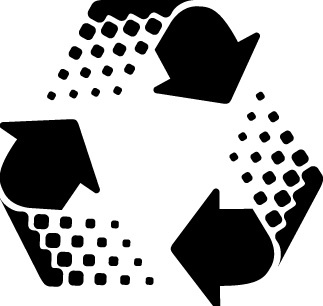 Many organizations, in fact, use this symbol in their posters, advertisement, and websites to encourage recycling. However, if your organization is using this recycle sign to make a claim that your product is “recylable,” “can be recycled,” or “made with recycled materials” then the use of the symbol falls under the specific regulations pertaining to it, as we noted above. The Recycle Now symbol consists of curved arrow with a heart in the end. This recycle logo, according to Basingstoke and Deane, is designed to become the universally recognized recycle symbol and to encourage people to take action. The heart is supposed to signify the “the feel-good nature of the recycling activity. This is primarily a European (German) recycle symbol. It means that the manufacturer of the packaging has paid an amount as contribution or license fee to a national recycling effort geared towards full recovery of packaging material and promotion of easy-to-recycle components in packaging. The recycling symbols used in what is known as the Plastic Coding Sytem include a thinner and simplified version of the Mobius Loop with a number in the center and an acronym (below the loop) denoting the kind of the plastic resin used. These recycling symbols are designed to assist recyclers with the task sorting the collected material. In recent years, these plastic recycling symbols are also commonly used as indicator by some people to determine the presence of what is perceived to be health-threatening chemicals. PET (also known as polyester, represented by the plastic recycle symbol number 1) is the most popular material used in disposable bottled beverages, food, and non-food packaging. Lightweight, inexpensive, easy to recycle, PET poses low risk of “leaching” breakdown products but experts caution against any repeated usage. PET is in very high demand among remanufacturers but the recycling rate for this material has remained low at around 20%. Found In: Soft drink, water, juice, and beer bottles; mouthwash bottles; peanut butter containers; salad dressing and vegetable oil containers; ovenable food trays. HDPE (recycle symbol no.2) is commonly used for packaging products with short-shelf life and common household chemicals and is believed to pose a low risk of contaminating contents with breakdown products. Versatile in its uses, HDPE are produced in either pigmented or unpigmented resin, with the pigmented variety found to be more resistant to chemicals and breakage. Found In: Milk jugs, juice bottles; bleach, detergent and household cleaner bottles; shampoo bottles; some trash and shopping bags; motor oil bottles; butter and yogurt containers; cereal box liners, bleach bottles. Recycled Into: Laundry detergent bottles, oil bottles, pens, recycling containers, floor tile, drainage pipe, benches, doghouses, picnic tables, fencing, mailbox posts, chairs, toys. PVC (recycle symbol no.3) is a tough, flexible, and chemical-resistant plastic commonly used for piping and and injection-molding. Rarely recycled, this plastic is considered to be dangerous in relation to food preparation and should not be allowed to come into contact with food when cooking. It contains chlorine and will release toxins to the environment if burned. Found In: Window cleaner and detergent bottles, shampoo bottles, cooking oil bottles, clear food packaging, wire jacketing, medical equipment, siding, windows, piping. Also used for peanut butter jars and water jugs, wire and cable jacketing. LDPE (recycle symbol no.4) is a tough and flexible plastic that has many uses, including heat-sealing nd insulation applications. LDPE is not normally recycled through community recycling programs, but in the past years, the number of local recycle programs that accept LDPE has increased. Recycled Into: Film and sheet, trash can liners and cans, compost bins, shipping envelopes, paneling, lumber, landscaping tiles, floor tile. PP (recycle logo no.5) is chemical-resistant, has a high melting point, and has the lowest density of all resins used in packaging. It is widely used in containers designed for hot liquids. Found in: Yogurt containers, syrup bottles, ketchup bottles, caps, straws, medicine bottles, straws and film packaging. PS (recycle symbol no.6) is characterized by its low melting point and is a good material for insulation. It can be manufactured into rigid foam products like the trademark Styrofoam. This material has long been on the watch list of environmentalists because of its widespread use and difficulty in recycling. Current evidence suggest that Polystyrene can leach toxins into food. The category “Other” (recycle symbol no. 7) includes material not categorized under any of the resin classifications above or combinations of any of those. Found in: Three and five gallon water bottles, certain food product bottles, , ‘bullet-proof’ materials, sunglasses, DVDs, iPod and computer cases, signs and displays, certain food containers, nylon, outdoor and camping bottles, gym bottles, baby bottles. This is one of the newer recycling symbols and is used to signify that the packaging is suitable for composting at home. This type of recycle sign is found mostly in packaging for organic fruits and vegetables. “Please put this in a bottle bank”. This recycle sign serves to remind consumers to recycle glass bottles and jars either in a bottle bank, where available or in a kerbside collection. Mobius Loop with X% in the center – this recycle sign indicates that a percentage (x) of the packaging or product is made from recycled material. This recycle symbol can be seen mostly in cardboard packaging. This recycle logo is an example of industry or organization-related recycling symbols. It is a proprietary symbol belonging to the 100% Recycled Paperboard Alliance, an organization of packaging companies promoting the use of 100% recycled paperboard among its members. This is an exclusive recycle symbol and only Alliance’s members may use it. ALU – this recycle sign indicates that the packaging or the material is made of aluminum and therefore recyclable. Recyclable Steel – this recycle logo mean the packaging or material is made from recyclable steel. This is our initial compilation of recycling symbols currently in use. We shall continue to update this page to add more specific recycling symbols or new ones being adopted by industries and organizations, in the future. If you would like to share other recycling symbols or know if any logo that you feel should be included in a comprehensive list of recycling symbols, as we envision this one to be, please feel free to leave a comment, and we will take a look. Haven’t seen half of the symbols appearing here. Must be European or something. Anyways, thanks for the info. I find what you wrote in no.7 plastic symbol alarming. Is this for real? is the same pvc sign or what?? Hi Ibrahim: Thanks for the visit. Yes, the symbol for PVC and uPVC (Unplasticized PVC or Rigid PVC) is the same – Plastic resin symbol number 3 -PVC. CAN WE USE THE COMMON RECYCLE SYMBOL ON OUR CORPORATE LETTER HEADS AND STATIONARY. IS THERE A SPECIFIC COLOR TO BE USED. i live in berrien county, michigan. the berrien co. landfill recycles styro but only recycles #1 & #2 plastics. is there a place in michigan or the U.S. that i could bundle & send all my #3,4,5,6,7 plastics to? please & thank-u. Just below the tabs at the top of the page you’ll see “Start Recycling” search boxes. Just type in “plastic” (or if you want to be more specific, #1 Plastic or PETE, etc) and your state or zip code. It will show you the different locations within Michigan and neighboring states where you can drop off or mail in plastics recyclables. Thanks. Very comprehensive resource of all the symbols you would see on plastics bought for home use. I do believe this is the most complete resource I have come across yet to describe every symbol I’ve ever seen and more. It must have taken some serious time to put this resource together and I appreciate it. What is the difference between HDPE with recycle no. 2 and with recycle no. 4. What is the difference in mechanical properties. Statistic: In 1999 HDPE accounted for 47% of plastic bottle resin sales, making it the second most widely used resin in plastic bottles. HDPE and PETE together accounted for 95% of plastic bottle resin usage. Description: Bottles made from HDPE come in both pigmented and unpigmented resins. The unpigmented resin is translucent. It also has good stiffness and barrier properties. Thus, it is ideal for packaging products having a short shelf-life such as milk. HDPE’s good chemical resistance allows it to be used in containers holding household or inductrial chemicals. The pigmented resin has even better crack resistance and chemical resistance than the unpigmented resin. Recycled products: Drainage pipe, liquid laundry detergent bottles, oil bottles, pens, benches, doghouses, recycling containers, floor tile, picnic tables, fencing, lumber, and mailbox posts. Statistic: In 1999 LDPE accounted for just 1% of plastic bottle resin sales. Description: Because of its toughness , flexibility, and transparency, LDPE is commonly used in applications where heat sealing is necessary. It is also widely used in wire and cable insulation and jacketing. Recycled products: Film and sheet, loor tile, garbage can liners, shipping envelopes, furniture, compost bins, paneling, trash cans, lumber, landscaping ties. NOTE: The molecular formulas for LDPE and HDPE are the same. The difference in the plastics is the density of the molecular chains. The density varies in the manner in which the polymeric chains form. In HDPE the chain is essentially one long continuous chain, allowing the strands to fold back upon one another and densely occupy space. In LDPE the chains have multiple branches, which interfere with a neatly organized packing of chains. Instead the packing is more disorganized, occupying more space and thus resulting in a lower density. This is actually a really cool post. I mean, I have seen these symbols all over the place, but I only recognize what a couple of them actually mean. Very cool stuff.